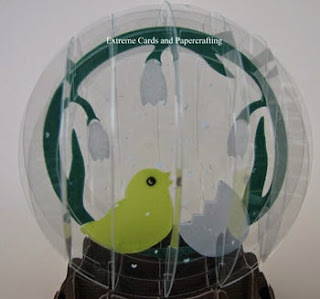 I had to pull out all my crafting tools to construct this Easter chick and egg sliceform snow globe pop up. The globe is acetate. I used overhead transparency film and cut it on my Silhouette Cameo. 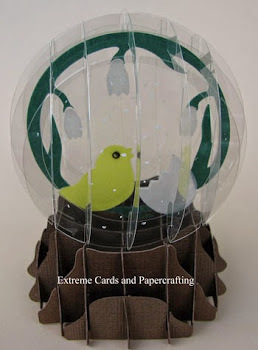 The base is Bazzill card stock. The chick, egg, and snowdrops are vellum. I cut two sets of everything except the flowers. I ran them through my Xyron Creative Station (remembering to mirror one of each pair) to add adhesive. 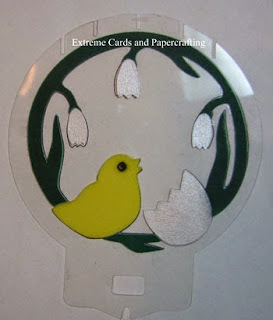 If you print out a copy of the design you can lay the acetate circle on it and use the printout as a guide to placing the pieces. I adhered the pieces to one side of the acetate circle, then flipped it over and put the matching pieces on the back. I left the flowers as a single layer to make them more translucent. The snow dots are white gel pen. The snow globe template is adapted from a commercially made pop up card I received from a friend. Since it's not my own design, I cannot share it. However, you could easily use this one from Elaine Wolfe. 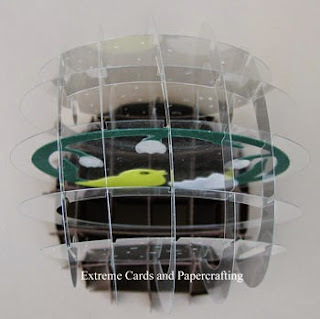 You would need to modify one large circle--the one with the slots at the top, on the outside edge of the circle--by not cutting out its center. 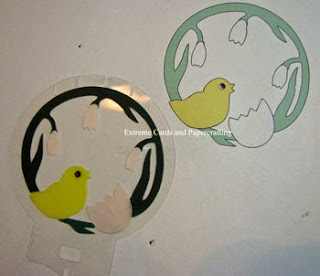 You want a solid, filled in circle of acetate. The chick and egg are from here. You could use any circular designs. 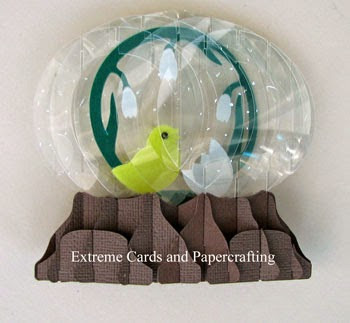 Adjust the size to fit your snow globe circle. It folds flat for mailing.